Double-blind peer review is the cornerstone of the academic publishing process. In double-blind peer review authors submit papers for consideration by journals, with author names removed before papers are sent to other researchers for review. Peer review reports are anonymised before being returned to the author. This process allows authors the benefit of being judged solely on the merits of their work (and not whether they happen to be new to a field, or whether they have had a fight with a potential reviewer). In turn, reviewers are able to provide honest feedback without compromising future academic relationships. Having published quite a few articles now, I have had a bit of experience on the receiving end of peer reviews. Feedback in some cases has been a 'light touch', indicating confidence in my analysis and conclusions, and in others a more rigorous review has been provided, giving the opportunity for extensive improvement in my work. All-in-all my work has benefitted from the peer review process. 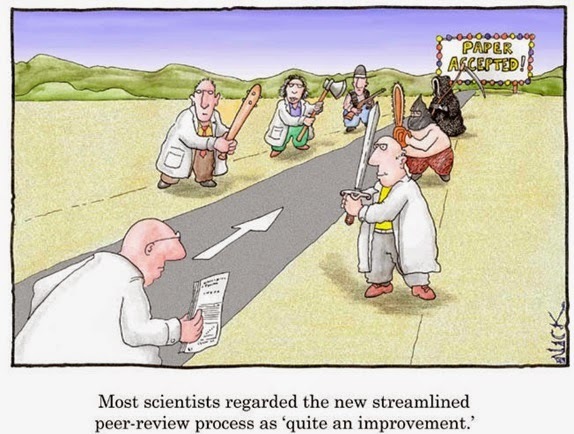 I have just had my first experience on the other end of the peer review process - reviewing another's work. I reviewed a paper for the Environmental Engineering and Management Journal. In reviewing the paper I had to decide what kind of reviewer I wanted to be - would I have a preference for being supportive or critical? I appreciated the reviewer that provided detailed, constructive feedback the most, and so decided to model my style on this reviewer, going through the paper and identifying issues, points for clarification and entire passages that could be strengthened. I hope the recipients of my feedback take the advice in the spirit it was intended - that I considered the work valuable enough to warrant contribution of my time, and that it will also be worth their time to develop the paper for future publication.